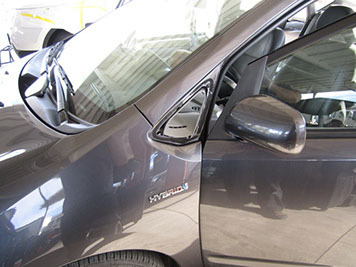 This Prius required a remove and reinstall of the left front vent window so that the fenders could be painted at Theodore Robbins Ford body shop. Ask about Our MOBILE SERVICES! We were called in to do a windshield replacement on a 2007 Jaguar XJ by the fine folks a European Motor Cars in Irvine, California. 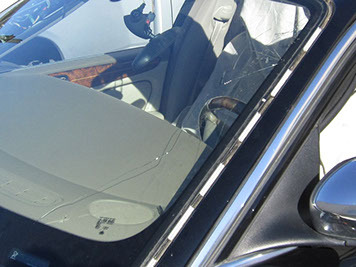 Apparently the windshield had suffered stone damage as you can see by the photo taken before we replaced the windshield. There is no way that this windshield could be repaired, the damage to the glass is extreme. This windshield replacement was a labor intensive, 2 hour install because it involved a Rain Sensor. We used a low conductive urethane adhesive to make sure that this job was done right the first time.